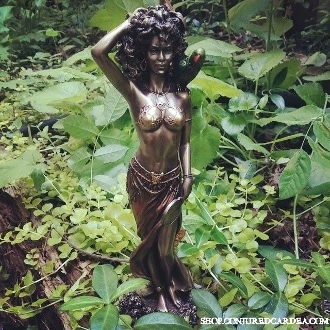 This is a STUNNING cold-cast bronze Oshun statue with AMAZING detail!!! She is 9 inches tall and is incredible beautiful! When people first meet Oshun they see her as Goddess of sensuality, but many people never get past this first impression. Oshun is the Goddess of Love and the Rivers. She radiates beauty and teaches us how to love and please our bodies. She teaches us to be creative, she fills us with ideas, dance and song. Everything beautiful belongs to her: all jewelry, amber, coral, fans, cowrie shells, brass, gold, river rocks, perfume, mirrors, shades of yellow, copper arm bands, copper bracelet’s, dancing, honey, and the number and multiples of 5. Oshun belonged to no man and believed all was fair in games of love. Create an altar for her with a yellow candles, some honey (TASTE it first! Oshun was poisoned by honey!) cinnamon, anise, pumpkins, amber, coral, and cowries. This stunning statue of Oshun is very special to me as it most closely resembles how she appears to me. She wears a beautiful costume of gold, metallic magenta and grass green. She also is adorned with a necklace, bracelets, earrings, and headdress. She holds her traditional comb in one hand-which she combs her hair with-and her mirror in the other.